and generated 3000 units profit in average per year"
People often ask me if there was only one system I would use to make consistent profits, which one would it be? I have developed so far 56 systems and I usually use multiple systems of mine, but if there is one system that I keep coming back to it year after year, I can tell confidently that this is the one: It is my own Holy Grail. Some players say, the Holy Grail is not the system, but the player. He/she must know how to act when a bad run/shoe is encountered, how to take advantage of winning runs, how to quit with profits, to know when to enter the game and when to exit and how to keep the profits permanently. The player needs to decide how to behave at different circumstances. That's true, but this behavior must meet certain conditions. One has to act one way or another based on certain criteria. If this criteria is different every time, then this holy grail becomes just one's gut feeling. If the criteria is the same every time and every time one achieves good results doing so, then this holy grail becomes systematic and it can be defined with a certain set of rules. IHG does exactly that. Every system will have its weak points, its nemesis, either in the bet selection or within the bet method. One needs to act upon those weaknesses properly. If the losses then can be minimized by applying those principles, then the profits take over, thus we have a consistently profitable system. IHG is based on existing principles. The idea is to use the right combinations. Like in nutrition, one must consume the correct food combinations. It is not good, for instance, to combine carbs and proteins within the same dinner, as this causes undesired extra fat. You may be surprised, but eating a tiny hamburger, containing bread (carbohydrate) and a piece of meat (protein) will cause more fat than a huge steak, green vegetables and a large salad. Just this simple formula alone, including not adding sugar to your proteins, could resolve the obesity problem in North America. In IHG also, the right combination of the bet selection and the bet method is very important. Since every bet selection and bet method have their nemesis, one has to apply the proper parameters in order not to get caught in those nemesis. This will strip off the system's weaknesses. The remaining portion of the system will be sturdy and rock solid. Those are the constituents of my Holy Grail. IHG has been generating over 3000 units in average on a yearly basis, playing about 500 shoes a year, year after year, for the past 12 years. This live performance is the best evidence for long term testing, much better than testing over Zumma tester books. In any event, I still took Zumma's first half (500 shoes) of the 1K tester book, just as a sample, to see if the performance of Zumma will be similar to live. And there it was. Over 500 shoes, it indeed generates 3616.45 units in Baccarat, commissions taken into account. This simulation will be given to you upon your purchase of the system document. IHG applies to all even bets and has been used for Roulette (Reds/Blacks, Evens/Odds, Highs/Lows), for Craps (Pass Line/Don't Pass Line), for Baccarat (Player/Banker), for Sic-Bo (Small/Big), etc. One of the nemesis handling parameters is the setting of the highest bet limit and it is 45 for IHG. 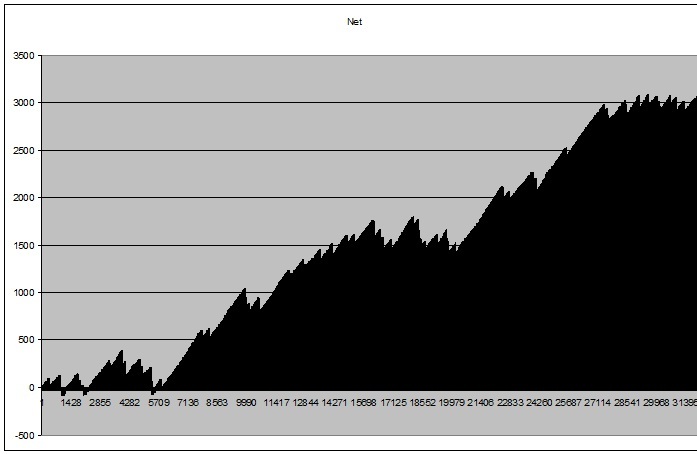 The above performance is achieved with this parameter requiring a lifetime bankroll not larger than 171 units. The high bet limit is a trigger to take a certain action. If it hasn't been reached yet, one still places the next bet, which determines if the run closes. The highest bet ever placed in this sample of 500 shoes was 88 units, which matches my live play very closely. You can experiment with the high bet limit value and you will be amazed that even with a lower high bet limit, such as 23, the 500 shoes will generate an end profit of more than 1100 units, which is suitable for lower budgets. One places bets on every decision using IHG. There is absolutely no tracking required. The only time bets are interrupted are within the nemesis control region and this interruption is usually quite short. So the system is very dynamic. It's excellent for casinos requiring the placing of the bets at all times when one is seated at a table. The system is only 14 pages of easy reading. IHG is a combination of a few formulae, the best ones. IHG goes only for $95 delivered to you by email with its 500 shoe sample simulation. $5 extra if you need a printout shipped to your address. If it's the Holy Grail, you will wonder how come it's so inexpensive. Well, that's because I'd like to share it with all of you. At a high price, the secret would remain mine only. If you win a lot with it (I know you will), you may want to send me a bonus, which I would gladly accept. My new system IHG - Izak's Holy Grail, announced last week was received with tremendous enthusiasm. After all, 3000 units made in live play per year for 12 years is not anything one could not consider. I was flooded with emails and questions and I'd like to summarize my answers for you within this FAQ newsletter. "Well, I just read about it and certainly will buy it for $95. The graph looks sensational, I have never seen anything like it. And, I like very much two of Izak's latest systems DAS and Trigger System. I am currently working on a system using my six grid and DAS betting the w/l registry FLD (follow last decision). Note the lack of huge drawdown in the Holy Grail. This is really unprecedented in my experience. Now, my glowing review is before reading the system, so without doubt it is premature. Sometimes great expectations are met with great disappointment, but for $95, there is hardly any downside. I see buying systems as buying information, so there is no loser. I have almost all of Izak's systems, and have learned a lot from them." "If you already have Izak's other systems then you will surely be getting the best of the best. I note the highest bet is 88 units in the Zumma test and average profit is six units per shoe." Q: What kind of buy in do you need to be placing 88 bets? Do you need pen and paper? A: 88 units were placed only once during the entire 500 shoes. For this a session bankroll of 171 units were required. The remaining time, highest bets hardly exceed 22 units. One does not need pen and paper. Very simple arithmetic is used for the entire process. Q: The question is not the buy-in but how often it happens and would you be able to place an 88 unit bet? A: 88 units was the extreme case and happened only once. Typically one closes a profitable run with bets not exceeding about 22 units tops. I assume that you obviously won the 88-unit bet and closed the run at that point or shortly after that. What would you have done if you lost the above bet? If 171 units is a session bankroll, how much is LIFETIME bankroll? Most Bac tables I see these days have a $25 minimum, thus 171 units would require over $4,000... a little steep by still feasible. In fact, I would rather profit 2-3 units/shoe with a 10-unit max bet than risk a 22-unit bet (which according to your description would sometimes escalate to 45 units) and average 6 units/shoe. After all, whether you bet 88, 45, 22 or "measly 10 units," your chances of winning that particular bet are still 50/50. A: The 88 unit bet is placed only once and not before Shoe 436 Hand 21 (for whoever has the MS-Excel simulation of the Zumma 1K shoes first half of 500 shoes. And yes, that bet was won. The net balance goes from +3028.50 to +3039.25 for that particular run. If that bet was not won, then the net balance would go to +2863.35 instead, not too terrible at that stage of profit. The run would end, in any event, whether the bet was won or not and we would reset and start a new fresh run right after. Yes, the chances of winning each bet is almost 50/50. That's why we need to come up with smart, creative and efficient systems, such as IHG, in order not to break even at the end of 500 shoes or a year's live play. With the maximum bet set to 10 units, IHG breaks even, so we need to have a bit more bankroll to reach the 3600 unit profit level. After all, we are competing against an institution with an unlimited bankroll and table limits, not to mention the built-in house edge designed to make players lose on the long run. The 171 units were the total drawdown for the entire 500 shoe set. I consider it as the lifetime bankroll. Q: Are bets carried over to the next shoe? A: Yes, the shoes are carried over from the end of one shoe to the beginning of the next shoe without interruption. If you want to end your daily session, you can do so any time, once you close a run. Q: Is the six units per shoe gross or net profit? A: It's net average profit, including commissions. Q: Will this newest work, make more profits or much less when playing "Dragon Baccarat"? There are lots of Casinos offering this now. A: I couldn't tell, as I haven't tested that option or variation of Baccarat. Q: Izak, in your 12 years of playing IHG, about how many times, or perhaps, once per how many shoes, were you unable to close the run and had to accept a loss on that particular run? A: Here are the stats for the live performance of IHG. The abandoned run costs about 100 units in average. Its frequency of occurrence is about once in every 10 shoes. Within a year's play this happens about 53 times, or about once a week. This matches also the chart I provided for the sample 500 shoes. The peeks of the graph show the abandoned runs. You can count about 50 of them. Playing 500 shoes a year, this makes about 42 shoes a month or about 10 shoes per week in average. Without an abandoned run, IHG would profit 162 units per week. With the once a week -100 unit run, this amounts to 62 units per week. Having played 10 shoes a week, the average profit remains 6.2 units per shoe. Q: If max bet is 45 why are you betting 88? What is win if you adhere to 45 and 23 unit max bets and absorb loss? A: The 45 unit is the set limit. If within a run, one places, say a 42 unit bet, the 45 units max bet has not yet been reached. If the system dictates the betting of higher than 45 for the next bet to be placed, one places that bet. Winning or losing that bet closes the run. The highest it went was 88. Q: How many total units are you out (minus) for this or any shoe when you place the 45 unit bet? A: Around the 45 unit bet level, one could be out by about 60-70 units. Q: Well that's in the neighborhood of $2700 or so, Now two shoes like this one back to back would put a guy down over $5400 or so. Am I missing something? A: That depends on your unit size. In any event, IHG tries to prevent back to back losses with its smart parameters and nemesis handling routines. The average profit of 6.2 units per shoe for live play remains unaffected. My casino has both, live and machine/automated Baccarat games. The minimum for the former is $25 and for the latter is $10. Live games tend to be extremely slow, i.e. it takes nearly two hours to deal a shoe. On the contrary, machine games are approximately two to three times faster. Using 6 units/shoe as an average profit, should produce roughly the same per hour result for both options: 25x6/2hrs = $75, and 10x6/0.8 hrs. = $75. The main advantage is of course, is lower max bet and consequently lower initial bankroll. Have you played the IHG in automated or online games and were you results comparable to playing it in live games? A: Yes, in the last 12 years, I have used IHG in all sorts of environments: real live play, real dealers and electronic screens, mechanical no dealer wheels and electronic screens, etc. The odds do not change, but only, as you say, the speed and unit size. Q: Can you please give the results for the Zumma 600 and the 501-1000 shoes of the Zumma 1000? A: I, personally, couldn't care much if IHG beats all Zumma shoes, after obtaining 3000 units profit per year for 12 consecutive years in live play. Each year about 500 shoes were played, much more valuable than a fixed tester book, isn't it? I still went and tested IHG against all Zumma shoes upon your request. Yes, the same parameters beat the entire 1K set and makes more than 4000 units overall for the 1000 shoes. For the 600 shoe set, IHG requires a larger bankroll, is good for 1-500 range tables and profits up to 8000 units. Even if a larger bankroll was required for the 600 shoe set, I would still not use a larger bet than the 88 units, thus a session buy in of 171 units. If we had used the same parameters also for the 600 shoe set, then the entire 1600 shoes would still generate a profit of 1100 units in total, which answers the question about the research of finding a system beating the entire set using identical parameters. Even in live play 3000 units per year is the average profit, meaning that one year IHG could generate 5000 units and another year just 1000. What counts is that in 12 years it has generated a total of 36,000 units, thus 3000 average per year, despite any fluctuations from year to year. So a final executive summary would be: IHG beats all tester books (1600 shoes) with a profit of 1100 units and makes 36,000 units in 500 X 12 = 6000 live shoes, all using the same parameters (max bet 90 and others), thus a grand total of 37,100 units in 7600 shoes in tester books and live play combined, quite a Holy Grail. This averages 4.88 units per shoe in average for all environments. 7600 shoes are half a million decisions, sufficiently long term, I presume. Thanking you all for your great interest, questions and feedback.